To me, it was beautiful even when I didn't, and the vague sense that I should recognize it created a not-unpleasant bridge between my sense of abstract beauty and my daily anxiety about knowing the right stuff. It's a sculpture by James Koester, part of a series now showing through Sunday at JEM Gallery, 225 E Broadway in Vancouver, BC. Stop by if you're in town. 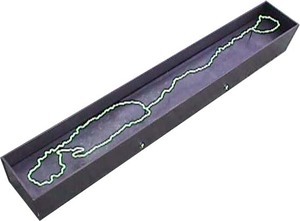 It consists of phosphorescent green lines of metal, floating on pins in a metal box. (In some pictures, you can see the line's shadow on the box, which creates a quivering feel.) The phosphorescent lines glow in the dark, and also look good peering through fog. (A fog machine was provided at the opening just for this effect.) 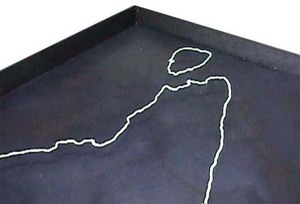 One version of this sculpture is 10 feet long. Once I did recognize the shape all kinds of interesting stuff flowed in. It's an spot of geography most of us have stared at maps of at one time or another, one that carries an almost unbearable spiritual and emotional charge: The long line is the Jordan River, with the Dead Sea on the left, the Sea of Galilee on the right. For countless people, this is a map of redemption, or covenant, or terror, or despair, though it is also quite plainly a map of water in the desert, which is all that will matter in the end. As water, it is also a map of history, since the Dead Sea has shrunk quite a bit since James selected this image. James's work with geography obviously touches an obsession of mine. He chooses simple water-lines out of the "real world," then renders them as abstract. Like photorealist painting, or photography for that matter, the art is partly in the frame -- the fact that artist's chose this exact bit of geography, and that every fjord in Greenland, for example, deserved his attention. But they're also simply beautiful shapes, whose beauty is in both their realism and their abstraction. Koester's work invites me to open an atlas and experience each coastline or river as he would render it -- a wiggling form in space. And since rivers and coastlines change every day, it is a beauty that we will always have, in abundance.